The Catholic Church in Oslo is named after St. Olaf, Norway‘s most famous saint. Analyzes show that a holy relic leg bone actually origins from the saint. The church agreed to analyze the bone, and a carbon dating has established when the owner died. – It was as close as we can get. We can say with certainty that he died between the end of the 900’s and 1040 AD, but most likely around 1030 AD. The investigations showed that the person was between 25 and 35 years old when he died. Olaf was probably 35 or younger when he died at Stiklestad, says religious historian Øystein Morten. DNA analyzes was conducted, and Morten has tried to find a relative of Olaf with no luck. The leg bone can still provide a lot of information that has not been known about St. Olaf. One of the surprises was his size. – This is the tibia in the lower leg. It was a little over 15.8 inches (40 cm) long, which means that this has been a person who has been about 5.9 feet (180 cm) tall. The average height at the time was around 5.4 feet (165 cm), Morten says. Contemporary sources named him Olaf Digre and Olaf Digerbein (Englsh: Olaf the Huge and Olaf Huge Legs), which meant he was a tall man. Radiographs also clearly show that he has been in combat, which was common for kings at the time. – We found scars made from an arrowhead just below the knee. He had quite a few injuries on this leg, suggesting that he had been in combat. Another leg injury may also have caused him to limp, says Morten. St. Olaf’s body was preserved in the cathedral until the 1500s before it disappeared. Morten says that it was common in medieval tradition to break off bones and send to other churches. 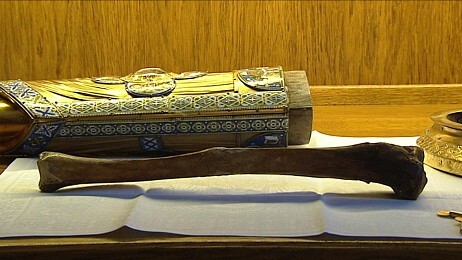 Yet, few people have believed that the church in the middle of Oslo was in possession of the king’s leg bone. – Historians have had very little faith in it. When I said I was going to investigate this leg, several claimed that it was a bone from an animal. Morten is convinced that it is Olaf who is the owner of the leg. The surveys show that there has been organic material around the leg and that the body has been dried and preserved. – Which means that he was mummified. I think this is very strong evidence that this is indeed St. Olaf, Morten says. The rest of the body will be difficult to locate. – He got an anonymous grave in the Nidaros Cathedral, and he is probably still lying under the floor, somewhere. We still know relatively little about St. Olaf. Morten, who has written the book “In search of Olaf the Holy,” believes there are many misconceptions. 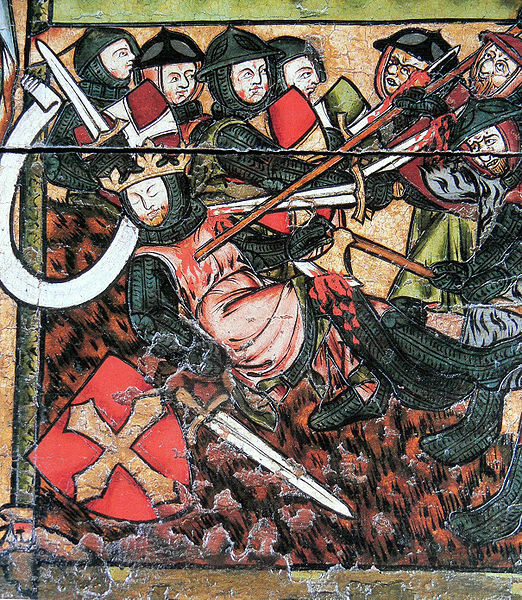 The man who is worshiped as Norway’s most holy person, in fact was a mercenary with much blood on his hands. – The way he runs business after coming to Norway is based upon violence and fear. His violence is really cruel, one of the scalds says that Olaf was chopping of arms throughout the country, and in this way he created peace. The remaining poetic verses about him are exclusively about war, battles and violence, Morten says.